Please join Wambete Soita, Head of Architecture, and FAED's Cultural and Outreach Committee for this Wednesday's arcfilm continuing our semester's Empowerment by Design series. 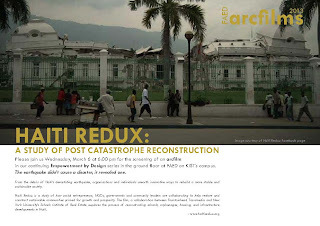 We'll be screening Haiti Redux: A Study of Post Catastrophe Reconstruction. The earthquake didn't cause a disaster, it revealed one. From the debris of Haiti’s devastating earthquake, organizations and individuals unearth innovative ways to rebuild a more stable and sustainable society. Haiti Redux is a study of how social entrepreneurs, NGOs, governments and community leaders are collaborating to help restore and construct sustainable communities primed for growth and prosperity. The film, a collaboration between Fountainhead Transmedia and New York University’s Schack Institute of Real Estate explores the process of reconstructing schools, orphanages, housing, and infrastructure developments in Haiti. Ground floor, FAED on KIST’s campus.